This entry was posted in 2013 and tagged dave, rajni. Bookmark the permalink. HUZZAH! Thanks! I had a lot of fun this year! Heh! ^_^ I honestly didn’t think everyone would be so interested on the identity of FerretFox… makes sense though! 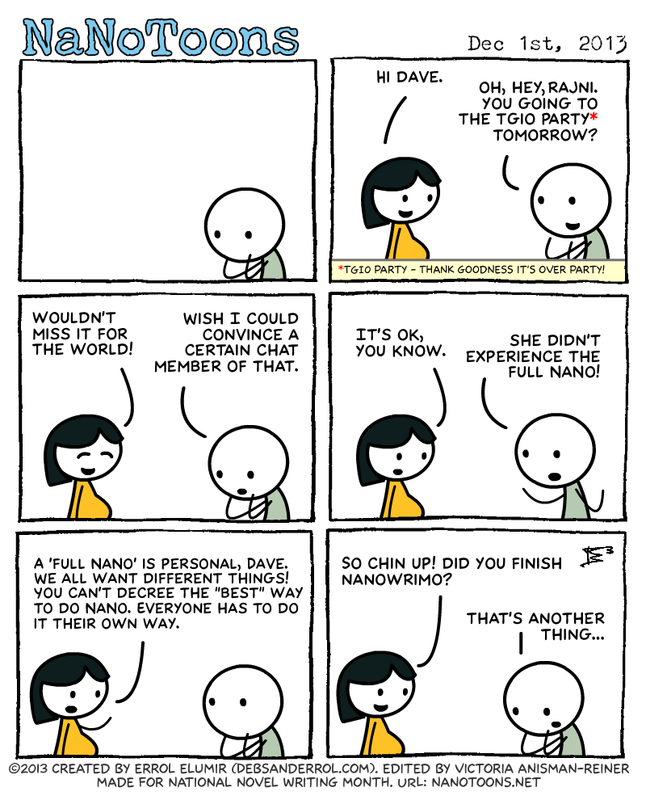 Winning NaNo is like an early Christmas. HUZZAH! Merry Christmas! ^_^ Congrats! In the four years I’ve done NaNo, this is the first time I went to any events, and it was only the kick-off party (granted, my region didn’t exist during the first two years, but I probably still would not have gone). I partake some in the online community, but going to events would just stress me more than I need during such a crucial time. One more comic…I sure hope we get to find out if Rob won or not. But did I write words? How many words did I write? I think I’d rather…. forget it. That’s as far as I got, but I thought I’d share. I realized this morning what the date was, and once I put it to the tune of November 1st, it just kinda…mostly flowed out. *LAUGH* That’s awesome. I tweeted the first line but with ‘recovering’ because it hit my head too! Finally i watch ‘real’ Manda and Errol. I love the comic stripe.